January 25th, February 4th, April 5th & June 14th. 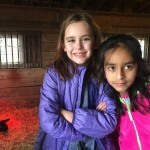 Elementary-aged children spend a day on the farm. Activities vary based on season and weather…Enjoy hikes, nature and farm fun, indoor STEM activities, crafts, games, baking and more. Dress for weather-outside activities daily; weather permitting. Based at the Old Floris Schoolhouse. Choose 8 AM – 5 PM or 9 AM – 4 PM. For information/ questions call 703-689-3104. Bring a lunch, drink and snack. Every day is a great day to be at the park! See table below for registration links. Choice of 8 AM – 5 PM or 9 AM – 4 PM. Spring Break is April 15th – 19th. Register for our Spring Break camp! Sign up today to experience the many seasons of Frying Pan Park!